The Master of Business Administration provides career flexibility, says business alumna Madeline Kenkel who recently completed her AUT MBA. “By profession, I’m an attorney and business law professor. I decided to study the MBA because it furthers both my business law and academic career opportunities. “I chose to study at AUT because it has a reputation for diversity and teaching practical skills,” says Madeline who came to AUT as an international student from the USA. The diversity was one of her favourite aspects of studying at AUT, Madeline says. She found that this diversity greatly enhances classroom discussions and activities. She would highly recommend the AUT MBA to other students, Madeline says. She made the most of the opportunities available to AUT students, and was the student representative on the MBA and Professional Masters Board of Studies, a player on AUT’s women's football team and a committee member of AUT’s Business Breakfast Club, where students can network with New Zealand’s top business and political leaders. 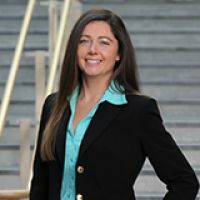 Since completing her MBA, Madeline has now returned to the USA where she is teaching business law and international business courses to bachelor’s and MBA students.